The Philippines on Wednesday cut its 2019 GDP growth target to 6-7%, from 7-8%, citing a delay in final legislative approval of the budget, and the economic planning chief said growth might fall to below 5%. Not even a meeting with President Duterte could break the impasse among lawmakers over this year’s stalled budget program. El Niño is parching farms and drying up water supplies in the Philippines, with the southern island of Mindanao taking the brunt of the irregular weather pattern that causes sudden drought-like conditions. The Philippines’ withdrawal from the International Criminal Court (ICC) takes effect on Sunday, March 17, 2019, throwing out a long struggle that took 11 years. The Philippine government is set to file a formal complaint before Belgium and the European Union (EU), which will also request them to stop funding alleged fronts of the Communist Party of the Philippines-New People’s Army (CPP-NPA) once it has gathered more proof. A REENACTED budget will likely result in the lowest GDP growth rate that the Philippines will see in nearly a decade as it would hamper jobs creation and the implementation of publicly funded projects. Online news outfit Rappler may be up for yet another case in court. TO raise further public awareness on the government’s strategic road map for its information and communications technology policy formulation, Department of Information and Communications Technology (DICT) Acting Secretary Eliseo Rio Jr. will delve on the National ICT Ecosystem Framework (NICTEF) at the 1*DATA Privacy and Security Solutions Day on March 20 at the Makati Shangri-La hotel. As the Philippines opens its market to cheap imported rice, the number of applications to bring in the commodity under the out-quota scheme has reached 1.6 million metric tons, almost near the projected record-high imports for the country. Farmers holding agricultural free patents may now sell their land or use it as collateral after President Duterte signed a measure that removed Commonwealth-era restrictions on lands covered by the Public Land Act. A PALACE official said the government is drafting an executive order (EO) to address the water crisis by rationalizing inefficient water management practices which had been flagged by economic planners, as continued shortages in parts of the capital entered their second week, forcing the authorities to prioritize critical users like hospitals. With the passage of the rice liberalization law, the Philippines has effectively lost its right to impose restrictions on all imported agricultural products. The water shortage in the eastern part of Metro Manila calls for the faster rollout and construction of the China-funded Kaliwa Dam project as a new water source for the metropolis, Finance Secretary Carlos “Sonny” Dominguez said Wednesday. President Duterte said he will give P1.5 million to agents of the Philippine Drug Enforcement Agency (PDEA) following the drug operation in Manila which led to the death of a businessman Monday. The Civil Aviation Authority of the Philippines (CAAP) is not considering banning the use of the Boeing 737 MAX 8 to and from the country. The defamation suit filed by Philippines’ Rizal Commercial Banking Corp or RCBC against Bangladesh Bank is not a setback to the efforts to recover the stolen money, the central bank has said. Senator Panfilo Lacson on Wednesday said former president and now House Speaker Gloria Macapagal-Arroyo could be held criminally liable for signing the version of the 2019 budget which contained post-ratification amendments by the House of Representatives. Local authorities on Wednesday bared new developments on the case of the 16-year-old student found dead in Lapu, Lapu, Cebu– saying that the teen is also missing a number of body organs. FOLLOWING the imposition of a safeguard duty on cement, the government is now eyeing to protect the float glass industry after it reportedly got hit by a surge in imports from 2013 to 2017. The country’s rice inventory in February went up by 19.24 percent to 2.141 million metric tons, from 1.795 MMT recorded in the same period last year, according to the Philippine Statistics Authority (PSA). THE Securities and Exchange Commission (SEC) has approved the incorportation of the wholly owned subsidiary of Philippine Infradev Holdings Inc. (IRC) that will build the $3.7-billion Makati City Subway system. The country’s mining sector will be in serious financial trouble once the government imposes a tax regime currently being pushed for by the Department of Finance (DOF), which could lead to the industry’s eventual downturn. Emer de Lina, 59, expected that when she returned to the Philippines, there would be improved roads and basic services as well as reasonably stable prices for necessities. The European Union asked the Duterte administration to present evidence proving that some groups that receive funds from its member countries have ties to the communist rebellion, a military official said Wednesday. Philippine tycoon Enrique Razon is pushing to build a new dam east of the capital to prevent another water shortage hitting thousands of people in Metro Manila as the dry season begins. Vehicle sales in February this year slightly improved by 0.6 percent to 26,327 units compared to the 26,176-unit sales in the same month in 2018, the Chamber of Automotive Manufacturers of the Philippines, Inc. (CAMPI) reported Wednesday. Despite cybersecurity issues hounding Huawei, the Philippines will have to secure concrete evidence of possible threats before blocking the Chinese information and communications technology giant in the country. President Rodrigo Duterte again expressed readiness to face a death sentence should the International Criminal Court (ICC) find him guilty of crimes against humanity in connection with his war on drugs. THE Department of Finance (DoF) said the 4.4% drop in foreign direct investment (FDI) net inflows in 2018 is temporary due to uncertain global economic conditions, with the Philippines poised to implement reforms that will improve the investment environment. The percentage of Filipino adults using the Internet have reached record-high in the latest Social Weather Stations (SWS) survey. Marawi City Vice Mayor Arafat Salic was arrested Wednesday morning at the city hall over rebellion charges. A 4.1-magnitude earthquake struck Davao Oriental on Wednesday, March 13. The Philippine Institute of Volcanology and Seismology said the quake struck 75 kilometers northeast of Baganga at 2:14 p.m. The Philippine Air Force will not be starting cloud seeding operations any time soon, because it does not yet have approval from the Armed Forces of the Philippines. At least 12 members of the Bangsamoro Islamic Freedom Fighters (BIFF) were confirmed killed in air and ground assaults launched by the military in this province since Sunday. A P1.6-million cash reward awaits anyone who can give information that will lead to the arrest of the killers of 16-year-old church collector Christine Lee Silawan. Philippine Airlines (PAL) now offers 30MB of complimentary in-flight WiFi for regular passengers and 100MB for business class passengers with “speeds that rival your regular on-ground connections” according to the airline. A ranking official of the Department of Finance (DOF) says reforms should be implemented to encourage more foreign direct investments (FDIs) and improve the country’s investment environment. President Rodrigo Duterte on Wednesday said he would give cash rewards to agents of the Philippine Drug Enforcement Agency (PDEA) following the killing of a supplier of party drugs in a buy-bust operation on Monday. An environmental group on Wednesday opposed the plan of the Quezon City government to put up a waste-to-energy facility with the Metro Pacific Investments Corp., Covanta Energy, LLC and the Macquarie Group, Ltd. Troopers of the Philippine Army’s 15th Infantry Battalion recovered copies of the extortion letter being sent by the New People’s Army (NPA) to construction companies in Negros Island. Balanga Bishop Ruperto C. Santos has ordered the removal of fees for funeral masses and blessings in his diocese. The USS Blue Ridge, considered as the finest ship of the United States Navy and the most technologically advanced among its fleet, docked in Manila on Wednesday for another port visit. Agriculture Secretary Emmanuel “Manny” Piñol has ordered an investigation in the reportedly high prices of hybrid corn seeds in the country. To augment the water supply of Metro Cebu’s aquifer, the water body here plans to develop a new dam at the remaining water source in the hinterland and desalinate seawater for human consumption. President Rodrigo Duterte on Wednesday said he would fire “another set of officials,” as he decried anew corruption and red tape in government. The Senate will investigate the unusual water shortage being experienced in Metro Manila and parts of Rizal which are being serviced by the Manila Water Company. A Japanese business federation has invited Filipino companies to participate in the Association of Southeast Asian Nations (ASEAN) meeting slated on April 5 in Osaka, Japan, as it intends to benchmark with Philippine economic growth. Based on information on the website of the Metropolitan Waterworks and Sewerage System (MWSS), the main sources of Metro Manila’s water supply are the Angat, Ipo, and La Mesa Dams. The Department of Education-Region 11 (DepEd-11)-brushed aside allegations of the Association of Concerned Teachers (ACT) that it has banned the group’s members from performing election duties. AN independent think-tank said investment frozen by the open-pit mining ban could have sustained the Philippines through the recent drop in Foreign Direct Investment (FDI), which fell 4.4% in 2018. A top official of the Department of Health Regional Office 8 (DOH-8) on Monday reported a decreasing trend in measles cases in Eastern Visayas due to the intensified immunization activities. The Malasakit Center established at the Negros Oriental Provincial Hospital (NOPH) here has run out of funds but replenishment is forthcoming. An official of Metropolitan Waterworks and Sewerage System (MWSS) said that the severity of the water shortage in the east zone concession area serviced by Manila Water Co.is due to the company’s water treatment plant in Cardona, Rizal still being unfinished. The Metropolitan Manila Waterworks and Sewerage System is calling for a summit that will craft a 50-year water security and used water masterplan for Metro Manila to address future water crises in the Philippine capital. 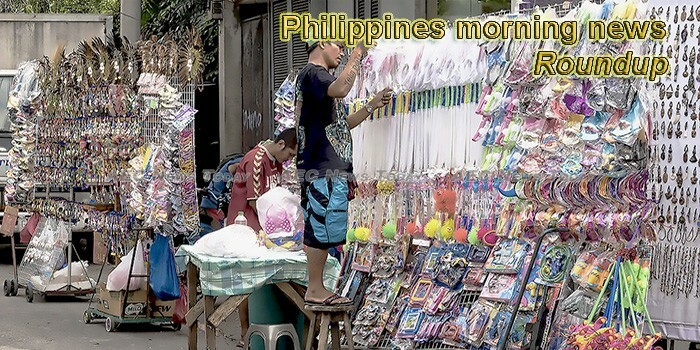 Philippines morning news by AEC News Today is your one stop source for Philippines news on matters of governance and policies affecting Asean business communities. It is published M-F by AEC News Today: Governance, not government; policies not politics.